For the first time ever, Pyr Books is making one of our novels available for free as an eBook. 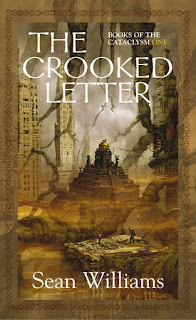 Sean Williams' The Crooked Letter: Books of the Cataclysm: One is available now, in its entirety, as a PDF. "[E]xplores the nature of life, death, and reality. Big subjects, but with the precision of an archaeological expert, Williams is more than up to the task. There is a lot to admire in Williams' epic fantasy, the wide range of global religions and myths of which his afterlife is comprised, to the characterization of the protagonists. The story has the mythic resonance of Neil Gaiman’s Sandman and American Gods, the dark fantasy/horror one might associate with something like Stephen King’s Dark Tower saga, the multiple universes/realities of Moorcock’s Eternal Champion mythos, and the strange, weird creatures one might associate with China Miéville’s Bas-lag novels. Williams imagined world is equal part those novels which preceded his, but fortunately, there is enough newness to both the approach and vision to make this the work of a singular vision...." [R]eading many of the other titles Lou Anders has published with Pyr, I shouldn’t have been surprised with both the quality of the writing and the breadth of Williams’ imagination. Like a lot of the other books published by Pyr, Williams captures what makes a tried and true genre like Epic Fantasy so popular and enjoyable of a genre and spins a tale with his unique voice. This is the type of book you finish and can’t wait to read the sequel." Download your copy here, and thanks for helping us spread the word! Too Much Pyr News to Keep Track of! The Final Cover for AGE OF MISRULE: BOOK 1! Sturges & Enge: Talk About Fantastic!